Mediums, Media, Culture and History - Hey, I'm John.Hey, I'm John. Last night, my Twitter feed burst with anger about The Entertainment Software Association’s position on the preservation of “abandoned” videogames. Apparently, the ESA, the trade association of the major videogame publishers, believes the preservation of “abandonware” videogames—games that are no longer supported, manufactured or otherwise published— is a form of hacking. And, in the ESA’s eyes, all hacking is a form of piracy. Perhaps the greatest irony here is the use of the term, “hacking.” The logic I’m sure is to play on the negative connotations around black hat hacking—the kind that leads to databases full of credit cards being stolen and Sony’s email littering the internet. Hacking used to not mean internet malignancy, not by a longshot. Back in the 50s and 60s, to hack was to do something new and cool with technology—“expensive typewriter” was an early hack to make massive mainframe computers function as a typewriter, for example. It is this flavor of hacking that led to the creation of the earliest videogames. Spacewar!, for example, was a 1962 hack of the Digital Equipment Corporation’s PDP-1. Steve Russell and his friends built and iterated on the game, slowly pulling together their dogfight-in-space game. Before Spacewar!, there was Tennis for Two, Willy Higginbotham’s 1958 tennis game hack of an analog computer designed for simulating missile trajectories. And in 1952, A.S. Douglas created a Tic Tac Toe hack, OXO on the EDSAC. The big difference between mid-20th century hacking and the sad state of affairs today? Tic Tac Toe, Tennis for Two and Spacewar! were all created outside the confines of intellectual property laws and the tangled mess that is media-based creativity. This is not a new problem. For as long as there has been mass-production, there have been attempts to protect creative work. The oldest example I know is from the early 16th century—the German artist, Albrecht Dürer. Dürer’s paintings were works in the medium of painting, while his prints were a form of proto-media—mass produced image products. His paintings were part of the ongoing dialog amongst Dürer, those who commissioned paintings from him, the institutions in which the paintings were hung, his fellow painters, those who wrote about his work, etc. In other words: the cultural infrastructure that swirled around his work. If you look at a book about the Northern Renaissance, you’ll quickly note a few things: there were only a few viable subjects (e.g. the Virgin Mary, baby Jesus, saints, portraits of the wealthy and powerful); many of the works are incredibly similar in composition, size color palette, painting technique, etc. ; and Dürer seemed to be a trendsetter and follower all at once. This is how material culture always works: there are conceptual, formal and experiential expectations around what a medium is and isn’t good for (I talk about these ideas in more detail in the first chapter of Works of Game). Dürer was nothing if shrewd. He was quick to adopt printmaking as a new outlet for his work. In printmaking, the artist found both a new audience and a means of self-promotion. He could create prints based on his paintings in order to spread word about them, and he could create original prints that could be sold to a less affluent audience. Soon enough, copies of his prints began to appear on the market without his authorization. He was outraged, and sought to protect his work and, in today’s terms, his brand. 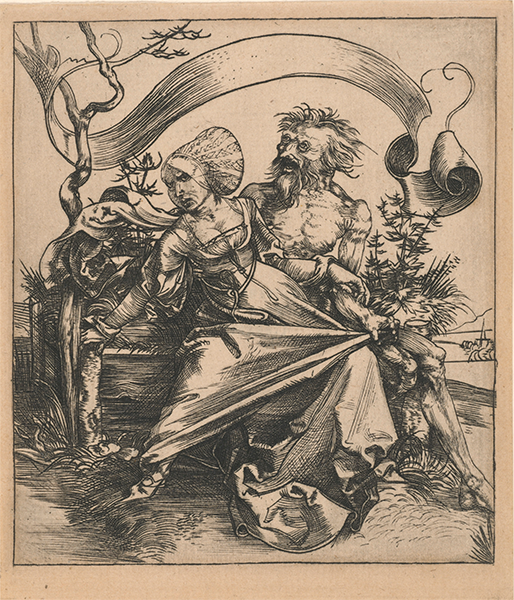 What we see happening with Dürer was the transition from a medium to media. Painting was a medium in the same way as sculpture and drawing. Because of the resources, time and skill it took produce a painting (or sculpture or drawing), copying was a concern. But with printmaking, where a single image could be reproduced hundreds of times in short order, the dissemination of works was much easier. Printmaking was a media, and therefore changed the ways artists thought about the intellectual property of their work. The main concern here is that the operations of creative culture, including the media products created by the members of the Entertainment Software Association, don’t really operate cleanly within the confines of intellectual property and copyright law. These things in fact push against the traditional ways culture is produced. It is a cycle of creation, inspiration, creation, inspiration, and on and on. A clear articulation of this is found in Kirby Ferguson’s “Everything is a Remix” series. Videogames are no different. Think no farther than the genre similarities we see with action-adventure games (who all seem to star variations on a unshaved white guy theme, or shooters with nearly interchangeable weapons, maps and bad guys). It is how culture works. The same happens with movies: how many super heroes will save the world and aging white guys will rescue their daughters this summer? But beyond the challenges in preserving videogames and their platforms, there is the lack of support around this work. Much of the cultural heritage field (e.g. art museums, the Smithsonian Institute, the Library of Congress, archeological and anthropological institutions, etc.) is viewed as important and thus worth the resources necessary to conduct the important preservation and historical research. Software preservation is far behind that of many other forms of material culture preservation, largely because sufficient philanthropic and public money isn’t being directed toward the ongoing efforts.You would think ESA would provide money toward these initiatives, or encourage its membership to do so. But thus far, that hasn’t been the case. Given this, the bulk of the work to preserve the history of videogames comes from fan preservation efforts. These efforts rely on passion, disposable income, eBay, and more often than not, ROMs and platform emulators. And this is what the ESA is calling hacking, and therefore piracy. I realize I’m deeply biased in my opinions about the importance of material culture histories, but I find the ESA’s position to be ridiculous, callous, and so clearly about the profit margins of its membership that it barely merits mention. And if I think about it for a moment, there is nothing surprising about this. The videogame industry is deeply uninterested in its past for any reason other than mining the nostalgia of its fan base for profit. Though the fans place emphasis on the videogame portion of “videogame industry,” the companies producing the games clearly put industry first—they might as well be selling razor blades. For the large companies paying dues to the ESA, a game on an obsolete platform is irrelevant. Why care about something that can’t be monetized? Or more importantly, why allow anyone to play it until the port to the current generation of platforms is complete? The more easily players can access ROMs for abandonware, the less profit potential there is for the release of games on Steam and iOS. This model is nothing new. Disney perfected it with the periodic re-release of its classic animated films, and the tightly-controlled release in emerging media and platforms. Disney, however, is wise enough to see the value in letting cultural heritage professionals do the work of preserving Mickey, Minnie, Cinderella and all those cats, dogs, mice and other creatures. Let’s hope the ESA and its membership eventually wake up to the fact they produce culture, not just products, and that they benefit from the preservation of their products by allowing them to be preserved and studied.